The Dolly fan documentary Hollywood To Dollywood has secured a one-week theatrical release in each New York and Los Angeles, an important criterion for consideration in major awards such as the Oscars. The picture was released on DVD and recently completed its festival circuit year with a screening at the Reel Heart Film Festival in Toronto, Canada, where it won Best Documentary and Best in Festival, the project's 24th and 25th festival awards. It will screen twice daily at Quad Cinemas in New York on 14th Street in Manhattan Aug. 31 through Sept. 6 and twice daily at Laemmle's NoHo 7 in Los Angeles on Lankershim Boulevard in North Hollywood Sept. 7 through 13. In related news, the film's stars, the Lane Twins, will be featured in the September issue of Australian gay interest magazine DNA on the project's first international award, Best Documentary at the Sydney Mardi Gras Film Festival. Also, the picture has been added to Watchbox Media's streaming video service for rental. Check it out here, and get the DVD here! Organizers are promising another unbelievable prize package from Dolly for this year's Evening of Elegance auction to benefit the Dr. Robert F. Thomas Foundation supporting healthcare in her native Sevier County, Tenn. Dolly contributes a major item for auction each year. Last year, it was the bedroom furniture from her former Dollywood apartment which had a $15,000 minimum opening bid. Two and three years ago, she gave away a night for two in the guest house of her Tennessee Mountain Home complete with breakfast prepared and served by Dolly and a barbeque dinner with Dolly and 10 of the winners' friends. That went for $90,000 two years ago and $75,000 three years ago. Previous items have included several autographed pieces from her wardrobe, an evening in her Dollywood apartment with a meet-and-greet and, a few years ago, a private dinner for two with Dolly that went for $10,000. This year's item will be announced at 7 a.m. Tuesday, according to a Facebook posting Sunday teasing this year's auction. The development officer for the hospital foundation posted a comment to the item saying: "All I heard after the bbq was it would never be matched, well Dolly fans it is about to be exceeded! This one is beyond belief and will most likely never happen again." Although An Evening With . . . Dolly remained steady on the Billboard music video DVD charts at No. 25 last week, the Cracker Barrel-exclusive product did see a slight dip in sales. The title lost 7 percent of its sales from the previous week, dropping to 379 copies sold during that time for a cumulative 16-week total of 46,561. In other sales news, the Joyful Noise Soundtrack from Dolly's latest film was the 29th biggest selling soundtrack CD of the week, moving 1,254 units for a 23-week total of 102,025. After popping back onto the charts for one week last week, 2007's The Very Best Of Dolly Parton, Volume 1 this week falls back off the Australian top 20 country albums chart, down from No. 20 in its 107th week. Elsewhere on the charts, Whitney Houston's The Ultimate Collection, with the late singer's cover of Dolly's "I Will Always Love You," rises three to No. 19 on the catalog albums list Down Under, while in Ireland the album slides six to No. 52 on the top 100 pop albums chart there. Cracker Barrel's An Evening With . . . Dolly holds on at No. 25 in the Billboard music video DVD chart this week, its 16th, the Aug. 4 tally issued Thursday showed. Her Joyful Noise Soundtrack slips six to No. 36 Christian and gospel albums in its 27th week, one to No. 13 gospel albums in its 28th week and 10 to No. 28 Christian albums in its 27th week there. "Man In The Mirror" from the soundtrack by co-star Keke Palmer falls off the 25-position gospel digital sales chart, down from No. 23 the previous week, its 16th. The late Whitney Houston's Greatest Hits, with her cover of Dolly's "I Will Always Love You," gains two to No. 136 pop and five to No. 21 pop catalog albums, dipping three to No. 7 R&B/hip-hop catalog albums. Overall, The Zac Brown Band's Uncaged remains steady at No. 1 country and loses one to No. 2 pop with 78,000 copies sold in its second week, while Kenny Chesney's Welcome To The Fishbowl holds steady at No. 2 country and drops six to No. 16 pop in its fifth week. For those wanting a little darkness with their coasters, Dollywood Nights returns to Dolly's theme park on Monday. The two-week event features the park's extended operating hours of 10 a.m. to 10 p.m., allowing rides on its coasters after dark. It concludes Aug. 12, after which it goes back to closing at 7 p.m. nightly. After being gone from the charts for four months, 2007's The Very Best Of Dolly Parton, Volume 1 this week re-enters the Australian top 20 country albums chart for a 107th week, coming in at No. 20. Elsewhere on the charts, the late Whitney Houston's The Ultimate Collection, featuring her cover of Dolly's "I Will Always Love You," dips seven spots to No. 22 on the catalog albums list Down Under. The six-position drop on the charts this week for the DVD An Evening With . . . Dolly corresponded to essentially flat sales last week, the numbers available from SoundScan showed. The set sold 409 copies at Cracker Barrels nationwide last week, compared to 404 copies the prior week. Since release 15 weeks ago, the set has moved 46,182 copies. And although no longer in the top 25 soundtrack album positions that are reported in Billboard, the music from Dolly's latest film Joyful Noise last week was the 30th highest seller for soundtracks with 1,321 copies moved, which allowed it to pass the 100,000-unit mark to cumulative sales of 100,819 in 22 weeks. The late Whitney Houston's The Ultimate Collection, featuring her cover of Dolly's "I Will Always Love You," rises 14 places this week to No. 46 on the top 100 pop albums chart in Ireland. Cracker Barrel's An Evening With . . . Dolly this week hits a new low on the 40-position Billboard music video DVD chart, tumbling six spots to No. 25 in its 15th chart week, the July 28 numbers issued Thursday revealed. On the spiritual charts, her 2005 recording "When I Get Where I'm Going" with Brad Paisley falls back off the Christian digital sales tally after re-entering for one week at No. 50, while her two charted singles from the Joyful Noise Soundtrack drop off the 25-position gospel digital sales list: "From Here To The Moon And Back" by Dolly with Kris Kristofferson and Jeremy Jordan down from No. 18 in its 14th week and "Higher Medley" by Dolly and Queen Latifah with the cast down from No. 24 in its 14th week. On that tally, co-star Keke Palmer's "Man In The Mirror" loses three to No. 23 in its 16th week. The soundtrack album slides seven to No. 30 Christian and gospel albums in its 26th week, three to No. 12 gospel albums in its 27th week and three to No. 18 Christian albums in its 26th week there. Whitney Houston's Greatest Hits, featuring the late singer's cover of Dolly's "I Will Always Love You," drops 35 to No. 138 pop, two to No. 4 R&B/hip-hop catalog albums and 13 to No. 26 pop catalog albums. The Grascals' Country Classics With A Bluegrass Spin, featuring Dolly on three tracks, falls out of the top 15 bluegrass albums list, down from No. 13 in its 64th chart week. Overall, The Zac Brown Band's Uncaged snags the No. 1 spot on both the pop and country charts by moving 234,000 units in its first week of sales, while Kenny Chesney's Welcome To The Fishbowl slips one to No. 2 country and two to No. 10 pop with 32,000 copies sold in its fourth week. Dollywood will be on ABC's Good Morning America on Friday, The Knoxville News Sentinel columnist Terry Morrow reported here. He says the show will feature new roller coaster Wild Eagle in a segment that morning. The ride will also be on The Travel Channel's Insane Coaster Wars on Sunday, the newspaper said. Dolly on Tuesday evening released a formal statement reacting to Monday's death of country music legend Kitty Wells, who passed away at the age of 92 of complications from a stroke. "Kitty Wells was the first and only Queen of Country Music, no matter what they call the rest of us," Dolly said.�"She was a great inspiration to me as well as every other female singer in the country music business.� In addition to being a wonderful asset to country music, she was a wonderful woman.� We will always remember her fondly. "�� One of Dolly's first professional recording projects as a teen-ager was covering several of Wells' songs for Somerset Records including her iconic "It Wasn't God Who Made Honky Tonk Angels." With her own success, Dolly would later find Wells covering her compositions, including "The Last One To Touch Me," "J.J. Sneed" and "More Love Than Sense." When Dolly put together her second supergroup trio, this time with Loretta Lynn and Tammy Wynette in 1993, she chose to name them the Honky Tonk Angels and the three ladies had Wells join them in the studio for a re-recording of her signature number. Even though she has said repeatedly she wouldn't do it because she doesn't like to "judge" anyone, a panel of music industry insiders polled by Forbes magazine included Dolly in their top 10 picks of possible replacements for Jennifer Lopez and Steven Tyler as judges on the next season of American Idol. Dolly has appeared on the program as a mentor. Read the full list here. Dollywood has hired a new ad agency to promote its properties, Ogilvy & Mather Atlanta, it was announced this week. In the press release, Dolly explained: "It has always been my dream to share my love of the Smoky Mountains and my love of family with others. Dollywood is a special place that does just this and the partnership with Ogilvy gives us a great opportunity to let more people know just how incredible it is." What does the Queen of All Media wear to rock out with country pop superstars Lady Antebellum in London? A Dolly t-shirt! Check out Perez Hilton with Lady A in a Twitpic he posted here. Thanks, Courtney! Whitney Houston's The Ultimate Collection, with the late singer's cover of Dolly's "I Will Always Love You," falls off the top 50 Australian pop albums tally this week, down from No. 47 last week, and drops eight places to No. 15 catalog albums Down Under, it was revealed Sunday. On the other side of the globe in Ireland, the album held steady in Friday's chart at No. 60 on the top 100 pop albums list there. 'Joyful Noise' Drops To 18 Screens In U.K. It looks like Dolly's film Joyful Noise is washed up across the pond. Starting just its second week in cinemas in the U.K., it dropped from its 105-screen opening to just 18 theaters last weekend to take in only �1,483 (about $2,297 U.S.), ranking around No. 47 for the weekend, figures released Thursday showed. The film took in �27,078 ($41,252 U.S.) during the Monday-through-Thursday week, which when added to its opening weekend total and this second weekend of ticket sales gives it a cumulative British and Irish gross of �60,766 ($94,143 U.S.). With the smaller British audiences compared to the U.S. market, that would be roughly the equivalent of a film grossing $1.5 million stateside over that same 10-day period. An Evening With . . . Dolly, the Cracker Barrel exclusive re-issue of Dolly: Live From London, gains a little ground this week on the Billboard music video DVD chart, the July 21 tallies released Thursday showed. The set moves up four spots to No. 19 in its 14th week. Elsewhere on the charts, an older track makes one list, as her 2005 recording "When I Get Where I'm Going" with Brad Paisley, which became her 25th No. 1 in 2006, re-enters the Christian digital singles sales list at No. 50 on the 50-position chart for a seventh week there. On the gospel digital sales tally, the songs from the Joyful Noise Soundtrack have mixed results, with "From Here To The Moon And Back" by Dolly with Kris Kristofferson and Jeremy Jordan up two to No. 18 in its 14th week, Keke Palmer's "Man In The Mirror" down two to No. 20 in its 15th week and "Higher Medley" by Dolly and Queen Latifah with the cast down two to No. 24 in its 14th week. The soundtrack CD falls off the 25-position soundtrack albums chart, down from No. 22 in its 20th week, while rising two to No. 23 Christian and gospel albums in its 25th week and four to No. 9 gospel albums in its 26th week, while losing one to No. 15 Christian albums in its 25th week there. The late Whitney Houston's Greatest Hits, with her cover of Dolly's "I Will Always Love You," gains eight to No. 103 pop, one to No. 2 R&B/hip-hop catalog albums and five to No. 13 pop catalog albums. The Oak Ridge Boys' Back Home Again, with their cover of Dolly's "Coat Of Many Colors," drops back off the Christian albums list and Christian and gospel albums chart, down from No. 46 and No. 73, respectively, in its fifth chart week. The Grascals' Country Classics With A Bluegrass Spin, featuring Dolly on three tracks, rises two on the bluegrass albums list to No. 13 in its 64th chart week. Overall, Kenny Chesney's Welcome To The Fishbowl remains at No. 1 country and dips two to No. 8 pop with 43,000 copies sold in its third week, while Lionel Richie's Tuskegee shoots up seven to No. 2 country and 14 spots to No. 22 pop in its 15th week. Long Island audiences will be getting a familiar face in its premiere of Dolly's 9 To 5: The Musical, The Gateway Playhouse announced Thursday. Emmy winner Sally Struthers, best known for her role on All In The Family, will be twirling her clipped pen as Roz in their July 18-Aug. 4 production of the show at the Patchogue Theatre for the Performing Arts in Bellport, N.Y. And it's not Struthers' first connection to the piece. In the 1986 re-launch of the 9 To 5 television series as a syndicated program three years after ABC cancelled the show, Struthers joined the cast in the role of Marsha McMurray Shrimpton, following the departure of Rita Moreno as Violet Newstead. The first-run syndication of the program lasted one 26-episode fourth season (plus after that additional re-run syndication airings with the ABC version of the show: a four-episode first season, 22-episode second season, and seven-episode third season). Read more about her appearance from Broadway World here. In related news, the show is also opening this weekend in Corpus Christi, Texas, where it will run five weekends at the Harbor Playhouse. Learn more about that production from The Corpus Christi Caller Times here. For those who have ordered Lulu Roman's new album At Last, which features a new duet with Dolly on her classic "I Will Always Love You," producer Larry Ferguson has posted on Facebook that the first orders for the physical CD will be shipped on Friday. Get yours from Ferguson Music here. For those who wish to download the track or the album, they have been released digitally. The album is available from Amazon.com here or iTunes here, while the Dolly duet alone is available for downloading from Amazon.com here and iTunes here. Dolly's Imagination Library literacy program continues to get noticed across the country. In North Carolina, The Fayette Observer announced the program's launch in Robeson County here, while in Illinois the Elgin affiliate celebrated registering its 5,000th child according to The Chicago Tribune here, and in Arizona the Payson area chapter was highlighted in The Payson Roundup here. Dolly's 9 To 5: The Musical is coming to the Theatre by the Sea in Matunuck, R.I., Playbill noted here. The show runs there July 18-Aug. 11. What was Hank Williams Jr.'s reaction to meeting Dolly when both were 19-year-old singers in Nashville? "Holy bananas!" he recalled in an Associated Press interview available here. Another local theatre is doing Dolly's 9 To 5: The Musical, Great Falls Tribune reported here over the weekend. Bigfork Summer Playhouse in Montana will produce the show in its new season. The late Whitney Houston's The Ultimate Collection, featuring her cover of Dolly's "I Will Always Love You," loses another seven this week to No. 47 Australian pop albums and holds steady at No. 7 catalog albums Down Under. As was projected here Thursday night based on chart performance, the Cracker Barrel release An Evening With . . . Dolly remained pretty much steady for the week in sales when it regained one spot to No. 23 this week. SoundScan numbers confirmed the set sold 395 copies for the week, a 5 percent drop from the previous week, bringing its cumulative total over its first 13 weeks of release to 45,369 copies sold. Also, the Joyful Noise Soundtrack with Dolly on four tracks continues to inch toward the 100,000 mark, selling another 1,527 units for the week to reach 98,065 since release. A Dolly-composed song is vying for Britain's most beloved No. 1 hit of all time. Whitney Houston's cover of her "I Will Always Love You" is among the 10 favorite chart-toppers in the U.K. as selected by the public. Music critics chose a short-list of 60 songs, and public votes narrowed that to the top 10, with ballots open for voting through next Saturday here on which one should be the top of the tops. The others in the top 10 are Abba's "Dancing Queen," Adele's "Someone Like You," Britney Spears' "Baby One More Time," John Lennon's "Imagine," Kylie Minogue's "Can't Get You Out Of My Head," Michael Jackson's "Billie Jean," Oasis' "Don't Look Back In Anger," Queen's "Bohemian Rhapsody" and The Beatles' "Hey Jude." While Dolly herself has never had a British No. 1 as a singer, she has broken the U.K. pop top 10 twice: with "Jolene" and "Islands In The Stream," both of which peaked at No. 7. In related news, Whitney Houston's The Ultimate Collection, which contains her cover, tumbles 16 spots to No. 60 on the Irish pop albums chart this week. Cracker Barrel's An Evening With . . . Dolly sold around another 400 copies last week to inch up one spot to No. 23 in its 13th week on the Billboard music video DVD chart, the July 14 numbers revealed Thursday. The Joyful Noise Soundtrack drops two places to No. 22 soundtracks in its 20th week, three to No. 25 Christian and gospel albums in its 24th week there, one to No. 14 Christian albums in its 24th week there and three to No. 13 gospel albums in its 25th week there. On the digital gospel singles chart, songs from the film dipped, with "From Here To The Moon And Back" by Dolly with Kris Kristofferson and Jeremy Jordan down five to No. 20 in its 13th week and Keke Palmer's "Man In The Mirror" down one to No. 18 in its 14th week, while "Higher Medley" by Dolly and Queen Latifah with the cast is up one to No. 22 in its 13th week. The late Whitney Houston's Greatest Hits, featuring her cover of Dolly's "I Will Always Love You," rises 10 to No. 111 pop and one to No. 4 R&B/hip-hop catalog albums while slipping one to No. 18 pop catalog albums. The Oak Ridge Boys' Back Home Again, featuring a cover of Dolly's "Coat Of Many Colors," re-enters the Christian albums list at No. 46 and Christian and gospel albums chart at No. 73 to log a fifth week on each. The Grascals' Country Classics With A Bluegrass Spin, with Dolly on three tracks, slips two on the bluegrass albums list at No. 15 for a 63rd chart week. Overall, Kenny Chesney's Welcome To The Fishbowl holds steady at No. 1 country and falls four to No. 6 pop with 61,000 units sold in its second week, while Luke Bryan's Tailgates and Tanlines remains steady at No. 2 country and loses five to No. 13 pop in its 47th week. Some Splash Woman photos by Dollymania.net correspondent Harrell Gabehart from Dolly's ride announcement appearance at Dollywood's Splash Country have been added to that section of the site here! Dolly's film Joyful Noise debuted last weekend at No. 24 in the U.K. and Irish cinema totals, taking in �32,205 ($50,594 in U.S. dollars). However, the British market is much smaller than the U.S. � its total weekend gross for all films was less than $13.4 million in ticket sales versus $210 million in the U.S. for the same three days � so a comparable gross in the States last weekend would have been around $800,000. It played in 105 cinemas across the pond. Great American Country (GAC) has announced the premiere date for Operation Pigeon Forge: A Family Story, which filmed in the city during Dolly's Homecoming Parade weekend in May. The half-hour special follows one Army family enjoying its vacation immediately prior to the father shipping out to Afghanistan and includes Dolly's annual parade plus the family getting greeted by Dolly herself. It airs at 9:30 p.m. July 12 with multiple repeats (check the TV listings on the left-hand column of the news page for re-run times). LaComedia, a professional dinner theatre in Springboro, Ohio (between Dayton and Cincinnati), on Thursday announced its 2013 season, which features Dolly's 9 To 5: The Musical March 7 through April 28. Check out their Facebook page here. Also, New Hampshire's Weathervane Theatre in Whitefield opens the show July 10, according to The Union Leader here. Dolly's Imagination Library literacy program is expanding to eight Arkansas counties under a new coalition funded by the Arkansas Community Foundation, The Times Herald of Forrest City reported here. In recognition of Independence Day, CNN's Money division and Fortune magazine counted down "100 Great Things About America," and Dolly was one of just six people so iconic that they made the list here. At No. 63, they noted she is "treasured for her songwriting hooks, buxom looks and record-breaking donation of books." The other people on the list were Bob Dylan, Pete Seeger, Lady Gaga, Woody Allen and Steven Colbert (Tupac's hologram also made the cut, but I don't consider his hologram a "real" person). Fictional characters, objects and events that made the top 100 included Batman, the "I Have a Dream" speech, Snuggies, Lucasfilms, LGBT Pride Week, Star Trek, the Blues and the Muppets. Thanks, Joe! Thanks to Dollymania.net correspondent Harrell Gabehart for the next batch of photos from last month's Dolly appearances at Dollywood. Tonight's galleries focus on catching her behind the fence between interviews. Check them out here! The Syracuse New Times in New York this week reviewed its local production of Dolly's 9 To 5: The Musical. Check out what they had to say here. Thanks to Dollymania.net correspondent Harrell Gabehart for sending in some new shots form last month's Dolly appearances at Dollywood. A couple of galleries of images from her Imagination Library appearance at the Chasing Rainbows Museum have been added to that section of the site here. Can't believe I missed this, but music publishing house Hal Leonard four weeks ago published a songbook of the music from Dolly's film Joyful Noise. Get your copy from Amazon.com here! In related news, the film soundtrack should be about to pass 100,000 copies sold within the next couple of weeks, while the DVD of the film has sold close to 750,000 copies since release. KidsFest opened at Dollywood last week and continues through July 29. This year's headliners are Chris Perondi's Stunt Dog Experience, about which Dolly said in a press release: ""Like so many folks, I'm just a huge dog lover. I truly believe they are man's�and woman's�best friends, and I couldn't be happier about giving families a show that goes 'dog wild' at my KidsFest celebration this summer at Dollywood. Our four-legged friends are going to put smiles on everybody's faces and warm some hearts, too." Also back is the awesome Gazillion Bubbles Show and Imagination Playhouse with live musical versions of Imagination Library titles The Little Engine That Could, Ladybug Girl and the Bug Squad and Otis. 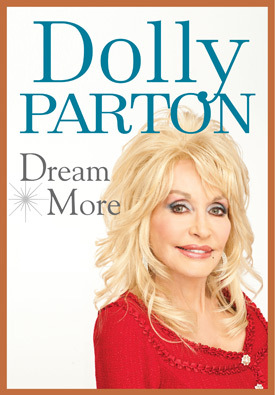 Putnam's Sons publishers has announced that an audio book version of Dolly's upcoming inspirational book Dream More will be produced in an unabridged format with Dolly reading the tome herself. Amazon.com is taking advance orders for the release, to come out the same day as the book itself on Nov. 27, here. This marks Dolly's second audio book, since she had likewise recorded an audio version of her 1994 Harper Collins autobiography My Life And Other Unfinished Business. Thanks, Tony! The Ultimate Collection from the late Whitney Houston, with her cover of Dolly's "I Will Always Love You," drops 10 to No. 40 Australian pop albums and two to No. 7 catalog albums Down Under this week.